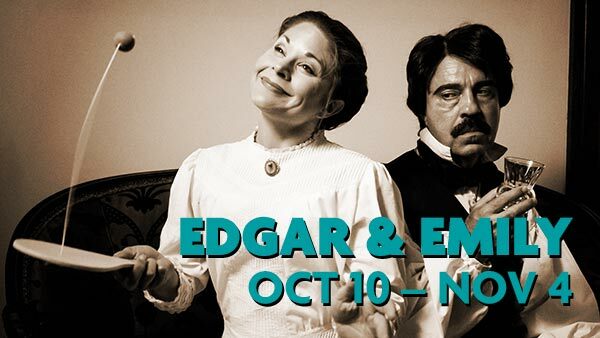 I can’t pinpoint the exact moment that I thought about joining Emily Dickinson and Edgar Allan Poe in a play together, but somewhere along the way the idea came to me about two and a half years ago and I’ve been obsessed with it ever since. The more I studied these two literary icons, the more I realized that though they had different public personas in our culture—the shy and reclusive Dickinson and the wild and macabre Poe— these perceptions of them were perhaps not wholly accurate. And in their writings both Edgar and Emily shared similar concerns regarding living, dying and finding one’s true artistic self. But how to put them into a play together? Especially considering that they never met and that Poe died before Dickinson wrote most of her poetry? Well as a playwright who had no interest in writing a docudrama anyway, it was time to put the research aside, use some imagination and a little artistic license and get these two characters into the same room. Eventually in the course of writing this play, they became my Edgar and my Emily in a story that I think is true even if none of it ever happened. I hope the result is both entertaining and thought provoking. And I hope they become your Edgar and your Emily too.